We’ve always fed birds. Wherever we have lived, one of the first things that gets unpacked, after the coffee pot and the toilet paper, is the bird feeder. It doesn’t take long for the word to get out in the bird world that there is fresh seed at our place. Within a day or so the first brave soul lands, checks it out and spreads the word to the others in the flock who are perched somewhere within range. Then another comes, then three more, then a whoosh of wings as whole flocks arrive. Sparrows, doves, finches, blackbirds. Suddenly our backyard is alive with flutter and song. Our habit is to fill the feeder when we get home from work. There have been times when we’ve come home and found the sparrows and doves are all lined up on the apex of the roof, waiting. The feeder is empty. I think they know our car! They know when it enters the driveway, food is on the way. But the only time we see a sparrow on the roof alone is when it is ill. The flock rejects it. Most likely, it is in it’s last day. It is always very sad for me to see a little creature isolated like that. The Bible says in Matthew 10: 29 says that not a single sparrow will fall to the ground without God knowing it. A popular hymn says His eye is on them. 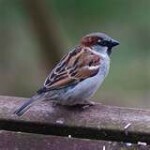 Sparrows are very common and numerous, yet God knows each one- just as He knows each of us. If you feel as if you are alone on the rooftop while everyone else is fluttering around in a flock, take heart. God is sitting there with you. His eye is on you. These are not your “last days”. His love can be the balm that heals wounds of the soul, brings joy back into your heart and strength back into your wings. You can belong to a greater flock – an eternal one. Turn, look and see – He is watching over you.